I designed a simple wing, where can I share it? I've spent some time designing a wing that was really cheap to build, very strong, very stable and capable of flying slow. The motivation came from having a lot of friend transitioning from flying quads to wings, so they can do it pretty well, but they don't feel very confident flying LOS. 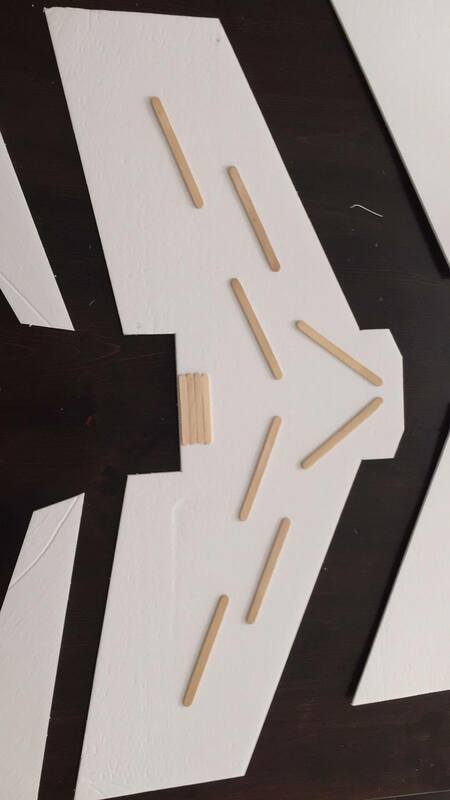 There are already some amazing designs online for free like the Ft-arrow, but the build process ends up being too complicated for most of the people I've talked to, also I want a design that fits in one sheet of dollar tree foamboard (mine measured 508mm x 762mm) it had to include control surfaces and winglets within this one sheet. So I came up with this design, I took it for a test flight and it's on rails! I was flying it with a 4s 1500mah battery and a 2207 2400kv motor. I was able to float around 20% throttle, and do some serious stunts at 60% throttle. I would love to get some honest and constructive feedback on my model, where should I post it? is there a specific part of the forum that would be ideal for this? - All the pieces need to be cut out, on this design you don't fold anything. - I made a motor mount out of an aluminum L bracket, 3d printed one would work too or maybe plywood? You can share it on the scratch builds section. I'd also recommend posting a video of it flying helps a lot to get an idea of what to expect. Nice looking wing BTW. I always wanted to fly a wing but found myself buried with other models and projects atm. Thanks for the feedback! I will make a post there too! I need to get a friend to come with me so I can record a video. The beauty of this wing is that it comes together really fast without worrying about bends, because it uses quad parts I hope that more people will get excited to fly wings! this is the perfect platform to learn LOS too! Looks like a fast and easy build. I think the swappable power pod plywood would work perfect for this. Seems like it would be a great trainer wing and acrobatic too!! Once I'm done with my 3 other planes I'll build this one too. Haven't owned or operated a wing yet so this would be a good intro. I'll probably adjust it to 2s or 3s to start (I don't have any 4s batteries,,yet) Looks and sounds like a winner to me. I do agree about a flying video sometime though. A friend of mine wants to use an 1806 motor and run a 2s battery, what I suggested is to cut the bay where the motor goes an inch deeper. that way you can use a lighter motor and battery and still get the cg right. Because you can have so many combinations of gear, I always advice to first place all the components you have (roughly) on the wing and check how the cg is, and if you find it's too tail heave with the battery all the way forward then you just make the motor bay deeper by 1/2 inch at a time until the cg is good again. I've got no interest in a wing. Your design looks awesome, though. 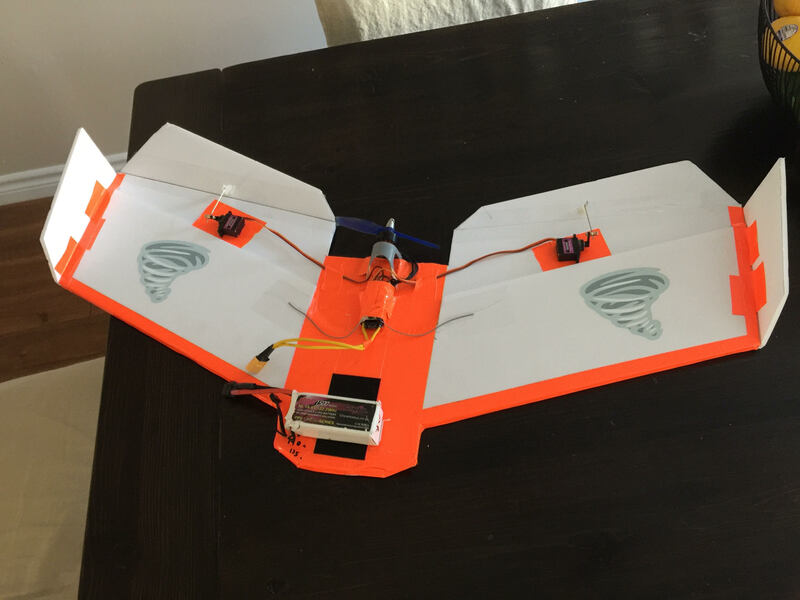 It looks like a super easy build and readily accessible to a newbie pilot and an experienced pilot that just wants to try something different. So tell me - Why a wing? I think your question is really valid, and to be honest, I designed a wing because I personally love wings. 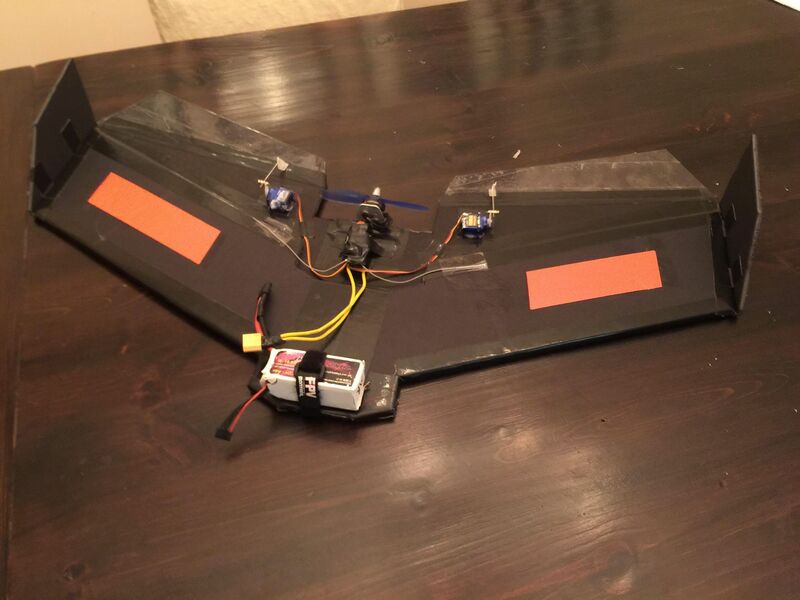 The very first "one sheet wing" I designed was over 5 years ago and for quite a few months I was flying them almost exclusively. Right around that time, something new came to the RC hobby "Quad racing" and I fell in love with it. I did quad racing non stop for the last 4 years and left all my other RC projects to the side untouched, a few months ago I started noticing a lot of "quad" guys transitioning to fpv wings for a change. But I could see the frustration in some of them regarding learning line of sight flying. In one hand they really wanted to learn, yet on the other hand they did not want to risk their expensive fpv + satelite + FC wings (which they flew fpv only, including needing someone else to help them take off) and all the available scratch build wings were intimidating to them (folding foamboard, airfoils, 4+ hours to build just the wing, etc). Since all these people had a lot of spare quad parts, I decided to do another design around the typical motor esc that a quad would use, but this time I challenged myself to design a stable wing that would utilize as much of the foamboard as possible. Getting a large wing load was key because I needed this wing to be floaty and not just a dart. So coming back to your question, wings are a lot of fun to fly because of their bank and yank nature. You can picture yourself in the top gun movie when you fly a wing pulling all sorts of acrobatic maneuvers. It's definitely a different beast than your typical 4ch models and the flying characteristics are different enough that you will feel the challenge and the reward once you master it. 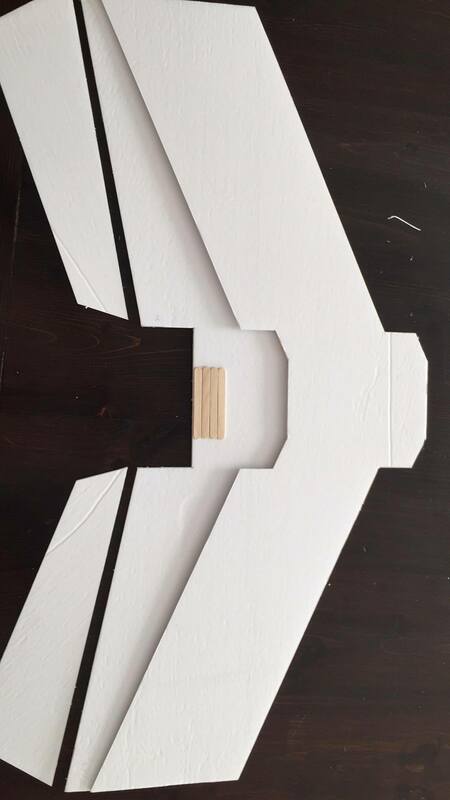 Regarding why I think this is a great starting point, this wing comes together really fast, there is no bending or airfoils (not true, it uses a KF airfoil, but for the purpose of this post you don't have to worry about airfoils), you only need one sheet of foamboard and it flies amazing. It can be fast, it can be slow, it's very stable and more importantly it helps you make mistakes with confidence. 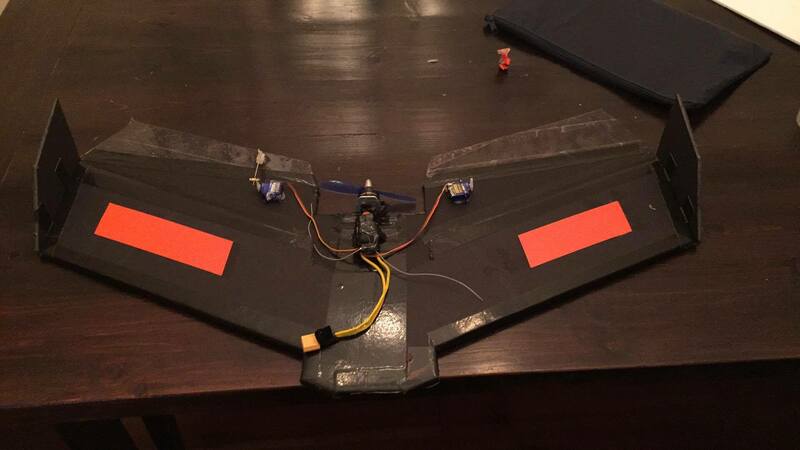 If you destroy this wing in a crash, you are 2 hours away form cutting another one and moving the electronics and going flying again. I always bring duct tape and popsicle sticks to the field because 80% of the crashes that compromise the structural strength of the wing can be fixed with a popsicle stick secured by a piece of tape and up you go in the air again (or hot glue instead of duct tape if you have a portable one). I would challenge you to at least build one (don't even worry about putting the electronics). and hold it in your hands to see if it speaks to you. My only response is why not? Personally I want to fly everything, wings, trainers, edf's, helis, quads, etc. I am not addicted to any type of plane but I am addicted to being in the sky. My brother is a multi engine pilot instructor and I'm just a couple tasks away from my light sport license. Because if flying rc airplanes he said I will be a great pilot. So one way or another I need to fly and it doesn't matter what. Being a vety simple design this would be a great intro to wings. Im not trying to be flippant towards you in any way, i just think he's on to something to get other nice people like yourself to have an easy chance of trying something new. Once I finish the DR 1 then I'll be building this. Just another way to feed my addiction to flight. Once I finish the DR 1 then I'll be building this. You do know what you just did, right? 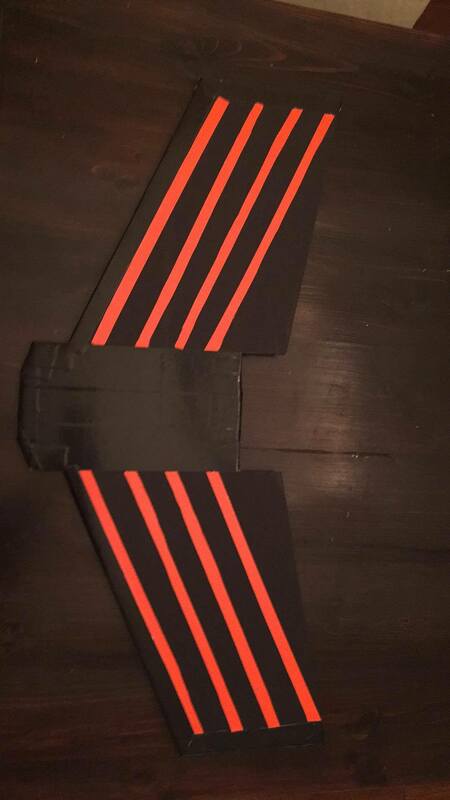 Looks like a fan wing. Am I right or not? what is a fan wing?